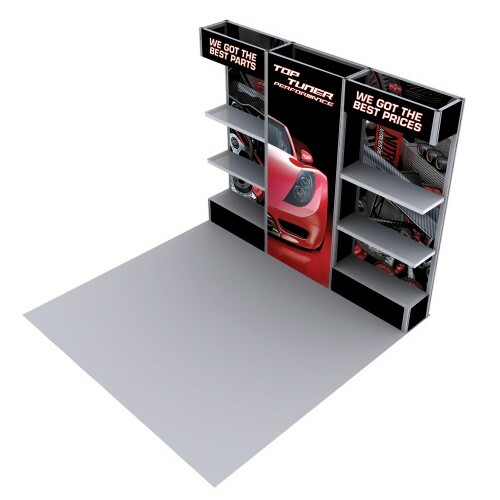 The Alpine Kit D is a portable modular trade show display with shelves to display your products or samples. This trade show booth is an attractive display that utilizes SEG push fit graphics, its sleek design with shelving makes for an enticing way to display products. Along with offering a wide variety of custom configurations, this modular trade show display can also come with useful or stylish additions such as doors, additional back walls, slat walls, shelving, monitor mounts and much more. The extrusion based frame is user friendly to set up and take down, and makes travel far easier. Product shelves are great for displaying products and samples. Portable Lightweight and heavy duty aluminum extrusion frame. Individual graphic panels make it easy to replace and re-brand over time.